For instance, in Manchester in November a 12-year-old girl was walking along the street when someone in a passing car shouted anti-Semitic abuse at her. The report noted 233 cases of abuse or threats on social media last year, compared to 88 in 2013. An image of Hitler, with the caption "Yes man, you were right" was widely shared over the summer. Social media is also being used to spread anti-Semitic messages, along with graffiti on the homes of Jewish people. Several cemeteries have also been desecrated - including one in Manchester in February: "Jewish slag" was daubed on gravestones. The report showed an increase in the number of incidents involving schools, Jewish schoolchildren or staff: 66 in 2014, compared with 32 the year before. Children at one Jewish primary in north London told the BBC last month they had experienced anti-Semitism while travelling to school and on school trips. They had also begun to practice what to do in case armed intruders attacked their school. The most visible Jewish communities in Britain are the ultra-Orthodox, the Haredim: they wear traditional clothes, with men bearded and wearing skullcaps. 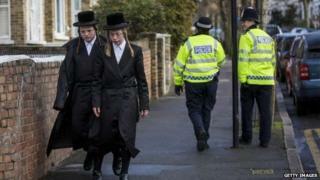 Britain's biggest Haredi community is in Stamford Hill, east London. Last week one far-right activist said he was planning a protest there next month - against "Jewification", according to a poster he put on Facebook. A leading figure in the Haredi community, Rabbi Avraham Pinter, said some in the community feared it might inflame tensions. But he said they had been "overwhelmed" by support from all quarters, especially other faith groups. David Delew, chief executive of the trust, said the increase in recorded incidents "shows just how easily anti-Semitic attitudes can erupt into race hate abuse, threats and attacks". Home Secretary Theresa May said the new figures were "deeply concerning", and she was committed to working with Jewish leaders and police to tackle anti-Semitism. Shadow home secretary Yvette Cooper said this was "an important report" which "must serve as a warning to everyone". Is there a ‘rising tide’ of anti-Semitism in the West?